In June 1984, the SLOOC commissioned Prof. Cho Yong-je of Seoul National University to design the official poster of the Olympic Games. In January 1985, Prof. Cho presented two draft posters, and a screening panel adopted the posters in April. The official poster represented the Games ideal of "Harmony and Progress" in the combination of two images. 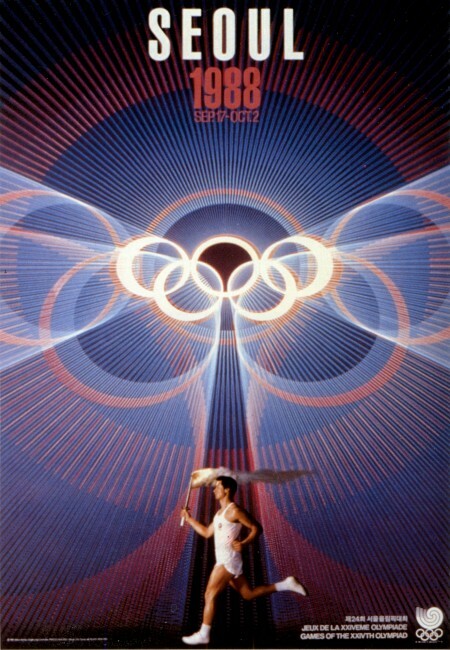 In the poster, the five rings symbolizing the pure Olympic spirit were rendered in bright figurative form to represent the Olympic ideal illuminating the world in peace forever. The image of the runner carrying the Olympic torch symbolized mankind's progress towards happiness and prosperity. The official posters were done with computer graphic technique, and light blue and bright orange colors were blended to symbolize Korea as the Land of Morning Calm. The SLOOC decided to produce 27 types of sports posters to introduce the sports of the Seoul Olympic Games and to establish a familiar image of the Games. On November 17, 1987, the SLOOC commissioned Prof. Cho Yong-je of Seoul National University and his associates to design the posters. The 27 posters represented the 27 sports of the Olympic Games including the demonstration and exhibition sports. They were done with a combination of photographic and computer graphic pictures. The photographs of athletes in competition were taken during the Seoul Asian Games and the Los Angeles Games. The photographic images of the motions were selected after suggestions and advice by the Korea Amateur Sports Association, while the selection of the athletes shown was done with discretion so as not to spotlight any specific race or country. The computer graphic pictures were included as the abstract expression of man's unquenchable energy, and formed an agreeable harmony with the photographs.